19 Mayıs Üniversitesi, Tıp Fakültesi, Göz Hastalıkları Anabilim Dalı, Samsun, Prof. Dr. Glaucoma, is a group of diseases due to responsible many factors characterized by progressive, irreversible structural changes at the optic disc and retinal nerve fiber layer, and the functional loss in the visual field . The primary purpose of the ophthalmologist is to determine the loss of retinal nerve fibers during the glaucoma diagnosis and follow-up; and to prevent and to stop development of nevre fiber loss. Conventional methods used for glaucoma diagnosis and follow-up are intraocular pressure (IOP) measurements, subjective examination of the optic nerve head and visual field test. IOP measurement alone is not enough for glaucoma diagnosis, because ıt shows the diurnal variation, individual differences and it is only one of many risk factors. Subjective evaluation of the optic nerve head , the different assessments of an observer and interobserver and individual differences of optic disc size and type, are reduced reliability. The visual field test is one of the indispensable assessment methods. 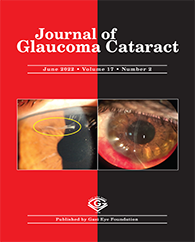 Nowaday, it is still a indispensable gold standard method to the diagnosis and the follow-up, to determine clinically of visual function, even if it is a subjective test, to be the short-and long-term fluctuation that undermined the reliability of the test.